Home / Blog / Despite improvements, hopes dashed for protected bike lanes on Milwaukee Ave. Despite improvements, hopes dashed for protected bike lanes on Milwaukee Ave. Newly unveiled plans for the once-in-a-generation reconstruction of Milwaukee Avenue in Logan Square feature many exciting improvements for walking, biking, and transit. However, they fail to provide kind of transformative change needed to create safer streets that prioritize people over cars, particularly for people on bikes. In an all-too-familiar story, community concerns about reallocating street space from car parking to protected bike lanes resulted in a watered-down proposal that does not seem destined to move the needle on Chicago’s harmful habit of car dependence. We are encouraging the Chicago Department of Transportation (CDOT) to go back to the drawing board and work closely with community members and other city agencies to create a more comprehensive plan to improve the street while meeting the needs of longtime residents and businesses. To be sure, elements of the plan such as the redesign of the traffic circle around the Bicentennial Monument promise much needed improvements for people walking, biking and using transit. Improved crosswalks, simplified intersections and protected bike lanes along a newly unified open space at the monument are major advances. The plan will also hopefully improve local bus service on the #56 Milwaukee Avenue bus route thanks to organizing and consolidating bus stops along the corridor. However, the majority of the corridor will continue to give priority to private car traffic over healthier, more sustainable and more equitable modes of transportation, like walking, biking and transit. The big change for people on bikes will be an upgrade from sharrows to…dashed bike lanes. Materials from the project team indicate the dashed bike lane design will leave more room to increase space for pedestrians and sidewalk cafes, which sounds great. Displays at the meeting show an addition one foot of space will be available for pedestrians – not exactly earth shattering. Meanwhile, Milwaukee Avenue is supposed to be a backbone of the city’s bike network as a designated Spoke Route in the Streets for Cycling 2020 Plan. A dashed bike lane next to parked cars and moving traffic does not create the comfortable environment for people of all ages and abilities to enjoy the benefits of biking for everyday transportation. Only a physically separated bike lane will accomplish that. If we can’t pivot from a car-centric design to more forward-thinking infrastructure like protected bike lanes and wider sidewalks on Milwaukee Avenue in Logan Square, what chance do we have of implementing these changes elsewhere in the city? Perhaps the answer to why the city has failed to deliver bold street design outside of downtown lies in the process we use for developing these projects. 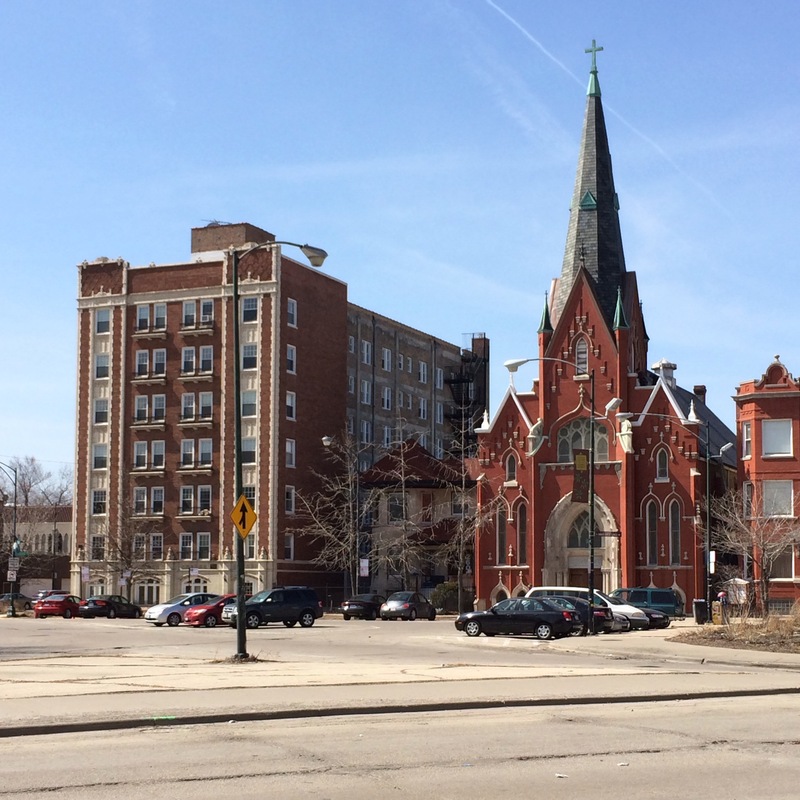 An alternative approach will soon be floated by community-based organizations in Logan Square, including Logan Square Neighborhood Association (LSNA) and LUCHA. Working with fellows from Chicago United for Equity, LSNA and LUCHA worked to conduct a Racial Equity Impact Assessment (REIA) of the Milwaukee Avenue reconstruction project. According to Race Forward, an REIA is a tool for ensuring public policies and developments consider how different racial and ethnic groups will be impacted by a decision or action. However, the typical CDOT project development process is not set up to address these issues. Without a way to capture concern about how a project will impact the character or affordability of a neighborhood, its no wonder issues like how changes to street parking will affect businesses are common stumbling blocks. A more comprehensive approach that proactively addresses the non-transportation concerns of longtime residents and businesses may result in the city garnering more support for bolder street designs. Logan Square is a neighborhood at the center of the conversation about how development and displacement are playing out in our city. The reconstruction of Milwaukee Avenue provides us a golden opportunity to change this story and explore new ways of integrating equity into community decision making. We are encouraging CDOT and other decision makers to review the REIA when it’s published and work with community members to implement the recommendations included in the report. We believe this will result not only in a more equitable outcome, but in a safer and better street design as well. In the meantime, you can view materials from the December 4 public meeting online and submit comments online.